Matthew Hogan has been a member of the Indianapolis Chamber Orchestra since 2007. He received his Bachelor of Music and Master of Music degrees in bassoon performance from the Indiana University Jacobs School of Music, where he served as Associate Instructor of the Bassoon Studio. His bassoon teachers include David McGill, Kim Walker, and Arthur Weisberg. 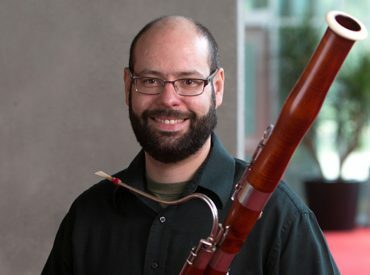 Based in Chicago, Matthew is an active freelance bassoonist and has worked with many orchestras including the Lyric Opera of Chicago, Ravinia Festival Orchestra, and Fulcrum Point New Music Project. He also holds the position of second bassoon with the Illinois Philharmonic Orchestra and as a performing member of the Chicago Philharmonic, works frequently with the Joffrey Ballet. As an educator, Matthew is the Applied Bassoon Instructor at VanderCook College of Music. Matthew is also Director of Music and Organist at St. Peter’s UCC in Elmhurst, Illinois. He has previously held similar positions at churches in Chicago and Indianapolis. Several chamber music series in Indiana and Illinois have featured him as bassoonist, pianist, and organist.